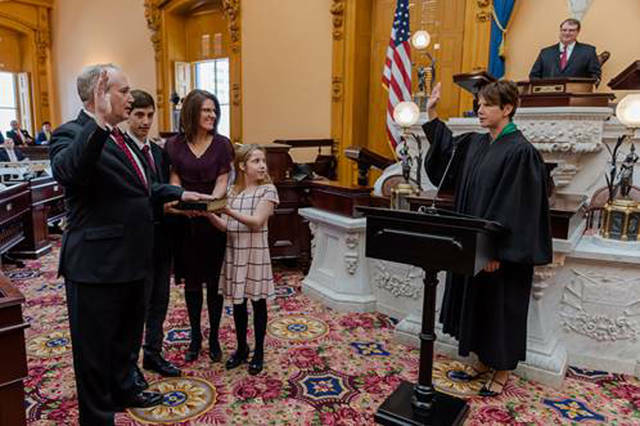 Keith Faber was sworn in as Ohio’s auditor of state. COLUMBUS — Auditor of State Keith Faber took the Oath of Office on Monday in the Senate Chamber surrounded by family, friends and colleagues. Ohio Supreme Court Justice Sharon Kennedy administered the oath. Faber is Ohio’s 33rd auditor of state. The ceremony was led by Senate President Larry Obhof and Mary Taylor. The Faber family also was joined by the Allen County Sheriff Department Honor Guard and Father Ken Schnipke of Immaculate Conception Parish in Celina.